Classically styled, lightweight and fast f/1.8 FX-format prime lens. With its updated classic exterior design and feel, outstanding NIKKOR optics and advanced Nikon lens technologies, the AF-S NIKKOR 50mm f/1.8G Special Edition is the perfect match for the Nikon Df and anyone who appreciates the feel of a classic lens. Its fast f/1.8 maximum aperture renders beautifully blurred backgrounds and maximizes low-light performance, and its 50mm normal perspective is ideal for everyday shooting. And despite its classic styling, the AF-S NIKKOR 50mm f/1.8G Special Edition is a fully modern NIKKOR lens with Nikon's advanced technologies, like Silent Wave Motor (SWM) for ultra-fast, nearly silent autofocusing with seamless manual override. Well suited for travel and everyday applications, the AF-S NIKKOR 50mm f/1.8G Special Edition will be your go-to lens for great shots. The lightweight, compact AF-S NIKKOR 50mm f/1.8G Special Edition is a great travel companion, especially when you need to freeze fast action or if a bright sunny day turns overcast. Its fast f/1.8 maximum aperture makes framing and focusing easier, and allows for high shutter speeds and full exposures under dim lighting conditions. When shooting wide open at f/1.8, the AF-S NIKKOR 50mm f/1.8G Special Edition renders beautifully blurred backgrounds (bokeh). Make a tack-sharp foreground subject stand out against a softly blurred background, a capability especially well suited for portraits. The lens' 50mm focal length (75mm on DX-format cameras) approximates the angle of view of our eyes, perfect for creating natural perspective in your photographs. The AF-S NIKKOR 50mm f/1.8G Special Edition is a remarkable blend of classic exterior styling and modern optics and lens technologies. Its focus ring features the easy to grip knurling/hatching from classic manual focus lenses, while its autofocus system uses Nikon's innovative Silent Wave Motor (SWM) for ultra-fast, near silent precision focusing. SWM also allows for seamless manual focus override when fine adjustments are desired. 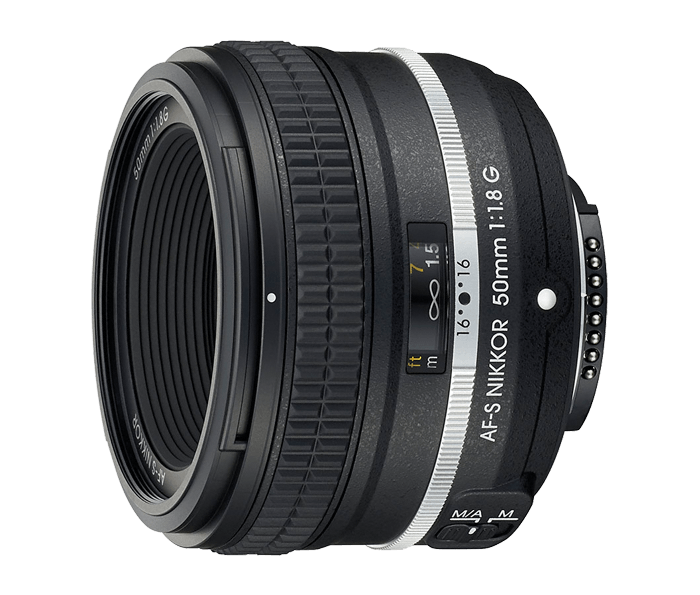 The AF-S NIKKOR 50mm f/1.8G Special Edition will give you years of brilliant performances.